Situational awareness: Hurricane Michael is intensifying and forecast to hit land between Destin and Apalachicola, Florida, tomorrow as a Category 3 or 4 storm. Go deeper. 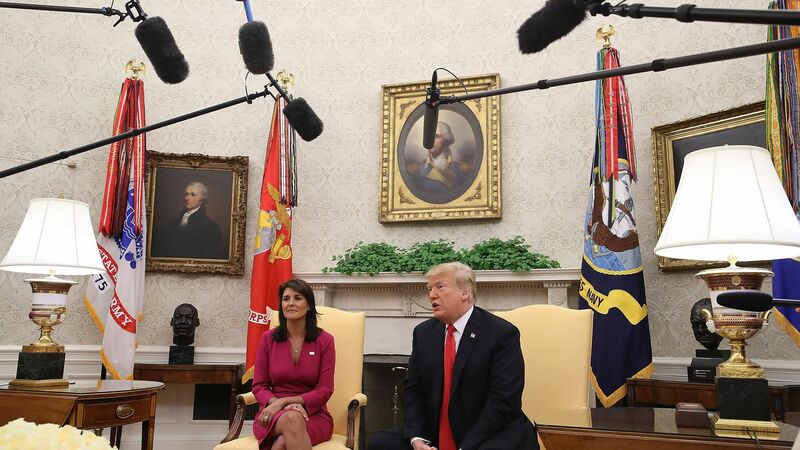 Nikki Haley's forthcoming exit, formally announced in the Oval Office this morning just minutes after being scooped by Axios' Jonathan Swan, took much of Trumpworld by surprise. Between the lines: The announcement came as a shock to many in the White House, and top foreign policy officials, including Mike Pompeo, were given very little notice. A frenzy of speculation about her motivations followed; almost none of it was informed by actual information, Swan reports. Trump told reporters today that Haley approached him with this possibility six months ago. She made that decision official last week, with a resignation letter dated Oct. 3rd. In her letter, Haley noted she has no plans to run for office in 2020, and will campaign for Trump. Haley also praised Ivanka Trump and Jared Kushner, calling him "such a hidden genius that no one understands." "To redo the NAFTA deal the way he did... What I've done working with him on the Middle East peace plan. It is so unbelievably well done. And Ivanka's been a great friend. They do a lot of things behind the scenes that I wish more people knew about, because we're a better country because they're in this administration." The bottom line: Trump now has an important but shrinking role to fill in his Cabinet. Under his presidency, the U.S. has gradually backed away from UN engagement, a trend that should be expected to continue with Secretary of State Mike Pompeo and National Security John Bolton in their respective positions. 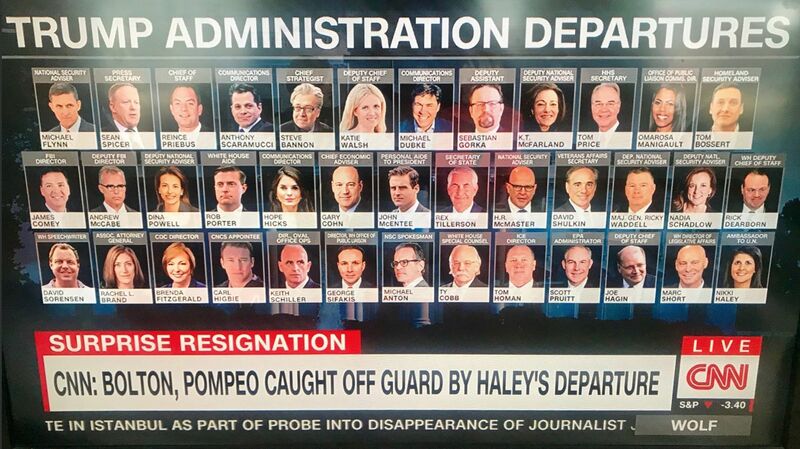 What’s next: Trump called Dina Powell a “person I would consider” to replace Haley, and said “Ivanka would be dynamite” but that he fears being accused of nepotism. “I think Ivanka would be incredible… that doesn’t mean I’d pick her,” he told reporters this afternoon. Google unveiled its latest Pixel phone today, along with a Chrome OS-based tablet and its own rival to Amazon's Echo Show. Details. Today was Brett Kavanaugh's first on the Supreme Court. He'll hear cases this week involving asbestos, immigration and a 1984 firearm law. Go deeper. Following up on its controversial story accusing China of implanting chips into Supermicro server motherboards to spy on companies, Bloomberg now reports that a researcher found a different implant in an unnamed company's Supermicro system. Go deeper. Former Secretary of Transportation Anthony Foxx is joining Lyft as its chief policy officer and is relocating to San Francisco to work full time at the company's headquarters, Axios' Kia Kokalitcheva reports. Democrats are topping polls over their Republican counterparts in pre-election day polling, according to new data from both CNN and the Washington Post. Go deeper. The Japanese have the most powerful passport on Earth, according to the Henley Passport Index, which measures how many of the world's 227 travel destinations can be accessed without a visa, or with a visa upon arrival.